Once a deed has been recorded, it is part of the public record and cannot be changed. It is possible, however, to amend that record by adding a newly executed deed, usually called correction or corrective deed, deed of correction or, in some states, deed of confirmation. As confirmatory instrument, it perfects an existing title by removing any defects, but it does not pass title on its own. A correction deed confirms the covenants and warranties of the prior deed. It needs to refer to that instrument by indicating its execution and recording date, the place of recording, and the number under which the document is filed. It also must identify the error or errors by type before supplying a correction. The body of this new deed contains the same information as the original deed and thus confirms the conveyance of title. Generally, all parties who signed the prior deed must sign the correction deed in the presence of a notary, who will acknowledge its execution. A corrective deed is most often used for minor mistakes, such as misspelled or incomplete names, missing or wrong middle initials, and omission of marital status or vesting information. It can also be used for obvious errors in the property description. For example: errors transcribing courses and distances; errors incorporating a recorded plat or deed reference; errors in listing a lot number or designation; or omitted exhibits that supply the legal description of the property. 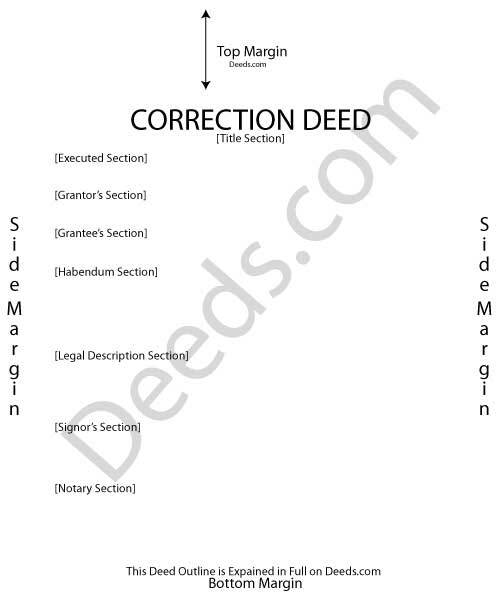 A correction deed can also amend defects in the execution or acknowledgement of the original deed. Resolving material errors often causes confusion. A material correction constitutes an actual change in the substance of the deed, such as changing the legal description, adjusting the amount of consideration, and adding or removing names. Some states allow a corrective instrument to address these flaws, but others require an entirely new deed. Non-material changes are generally typographical in nature and may be adjusted with a less involved correction. For example, some states accept a re-submission of the original deed with corrections, along with a cover page that contains a correction statement, error identification, and clear reference to the previously recorded deed. Depending on the error type and gravity, re-acknowledgement may not be required under such circumstances. In some states, an affidavit of correction or a scrivener's affidavit may be recorded and serve as notification of an error in a recorded deed. It is usually reserved for minor corrections and typographical mistakes, and it can often be given by persons other than the parties of the original instrument, as long as reasons for the correction and knowledge of the facts corrected are stated and evidence of notification of the original parties or their heirs is provided. However, it does not constitute an actual correction of the original deed in the way a corrective deed does. Changes affecting the legal description of the property are often sensitive in nature and best handled by a new corrective deed, signed by the original grantor. Some states generally recommend that both parties, that is, the grantor and grantee, sign a corrective instrument to assure valid title. For larger errors or to include/omit a name from the existing deed, a new standard conveyance, such as a warranty or quitclaim deed, may be more appropriate than a correction deed. Each state has its own statutory requirements for correction deed forms. These requirements determine the content or text that is in the deed. Correction deed forms must meet statutory conditions for content and format. In addition, many local recording authorities add requirements for margins, paper size, property identification, and many other details. If a deed form is not in accordance with both the local and state standards, there may be additional fees charged for recording or the form may be rejected altogether. The right form matters. With correction deeds, the little things can make a big difference. Deeds.com is meticulous about creating reliable and useful documents. All of our correction deed forms are available immediately after purchase. They are in Adobe PDF files and can be downloaded to your computer. They are fill-in-the blank on your computer so you can print them out completed. State laws, or statutes, determine the content of correction deeds. Find out more about your state's requirements by clicking on the state where the property is located below.